This packet is perfect for targeting the concept of "where". Packet contains 40 "where" questions using REAL pictures in a visual field of 3! 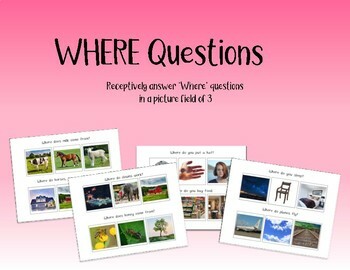 Also contains expressive "where" question list and progress tracker! 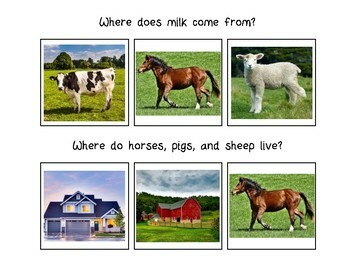 --Given a field of 3 pictures, the child will answer "where" questions related to occupations with 90% accuracy over 3 consecutive sessions. --Given a "where" question presented verbally and no visual supports, the child will answer the question with 90% accuracy over 3 consecutive sessions. Looking for more help with WH-questions? Check out my "Who" question packet here! Follow me for update, freebies, and new materials! !